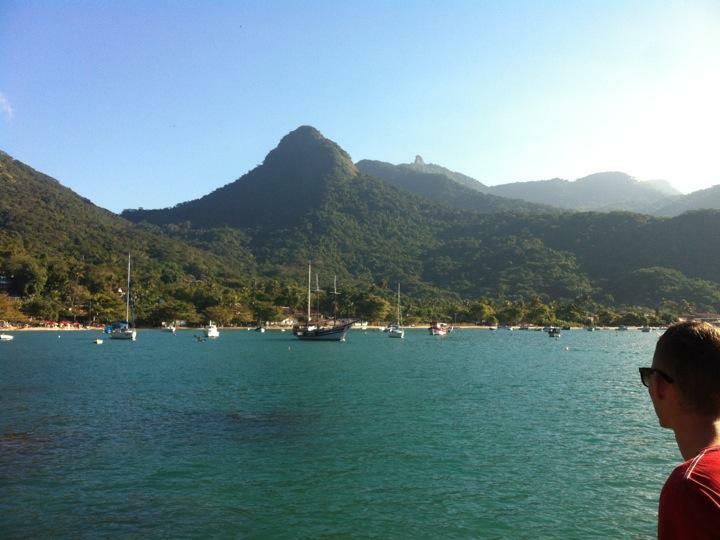 Barely 3 hours away from Rio lies a place called Ilha Grande. It is where loads of Brazilians from Sao Paulo and Rio go for vacation. Granted, the island is really gorgeous, looking like one of the islands from Jurassic Park and the weather is good, but Brazil isn't that cheap. I'm fairly sure you can find equal beaches is cheaper locations in the world, but this is great. Every night the tiny town consisting of two streets comes to life with music and street vendors, selling everything from bracelets to cake and proper food. There are two main locations that are renowned for their beauty, Lopez Mendez and The Blue Lagoon. Today I went snorkeling with a gang around the blue lagoon, diving around in the warm water, with a cloudless sky above. Saw tons of wonderful corals and fishes. Even a turtle that decided to come and check us out. The best thing: virtually no people (when we started). Upon arrival we saw one other small boat in the lagoon, but after doing a full lap around on of the islands and getting ready to get on the boat the lagoon was teaming with people. Some twenty odd boats, hundreds of people and tens of stereos pumping party music. This all by the time we left, so we were fortunate to see everything BEFORE the massive groups arrived. No chance we would have seen as many fishes, or anything, as we did with a multiple of ten of the people present upon our arrival. Then we went around half the island, sun bathing on the beaches, trying to scale the banana trees and get some fresh fruit, eating some food. When we got back home, around 4, I made it out on a jogging trip before nightfall even, which felt kinda necessary after all the cheap crap I've eaten, all the strong drinks I've had, all the nights I've gone to bed hungry. Can't call it a really good workout, but I was tired enough before I got back, and the trail was magnificent. Felt like Indiana Jones fleeing from a hungry pack of rat-monkeys just by following the path. Now it's time to go out and eat at some restaurant with a couple of german girls I met around the hostel.